I had an idea for a skirt for A and the base pattern would be the Oliver + S Sunday Brunch. So, first up I made one straight up to check sizing and how it all comes together. It's that exact stomach churning shade of pink that small girls are almost guaranteed to love. The fabric was gifted to me by a neighbour of a relative and is a nice cotton drill. 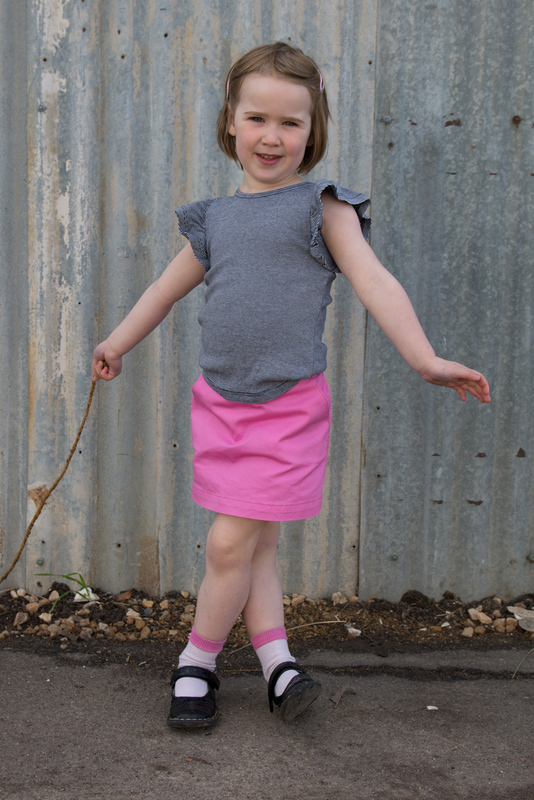 Perfect for a test run and as predicted she loves her "Barbie skirt". As an aside, did you know Barbie has had over 36 careers? The kids have recently discovered Netflix and are now regularly showering me with Barbie facts. She's been an Astronaut, a Veterinarian, a Racing Car Driver... And apparently she invented Pinkacillin which is a cure for Plastic Pox. Of course I couldn't let that one slide and the kids then got a very informative (read: long winded) lecture on Pox viruses and moulds and bacteria and their differences, as well as the discovery of penicillin and the launch of modern antibiotics onto the world. Fascinating mum. I made a straight size 5 skirt and I love the shape and fit. It's short without being an indecent mini. Just A-line enough for plenty of movement and has cute little slanted pockets. The waist to hip gradient is not great, and last time I made this skirt she was only one. Trying to get it on over a cloth nappy was almost impossible. Now that she has a slim backside the fit is just adorable. 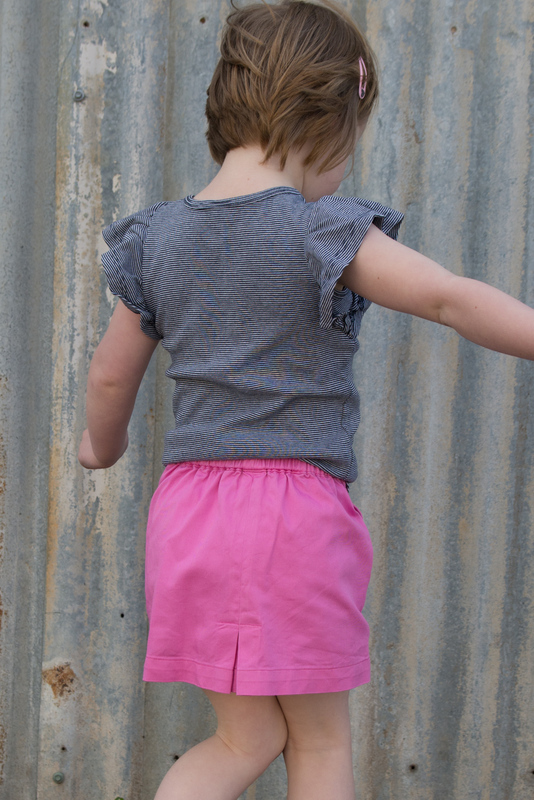 A little kick pleat at the back makes it even easier to run and jump and twirl about. She'd found a bit of old rope in the back street so I was frantically snapping shots as she put the skirt through all kinds of manoeuvres! This pattern is Oliver + S old school, dating back to Fall 2008. It's now only available as a digital pattern unless you stumble on a paper version on Ebay. I noticed the evolution of the instructions over the years in going back to the very beginning with this one. Curiously, there was no mention anywhere of finishing the side seams. My advice is to finish them together and press towards the back. It was exactly the skirt I wanted it to be for the modification I had in mind. That one was made quickly afterwards and met with the oft heard exclamation : "That's NOT pink!" Yes that truly is a Barbie shade of pink - she must be thrilled! 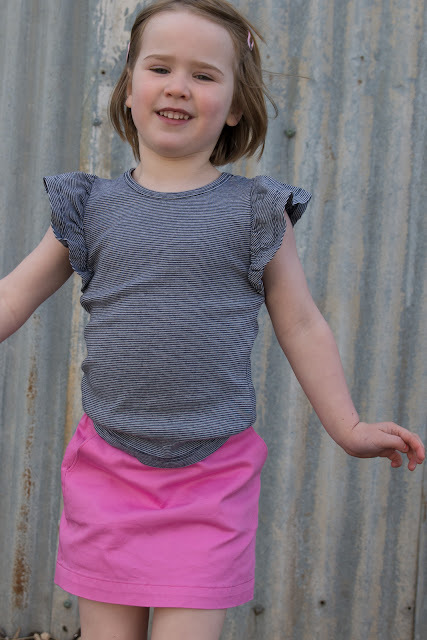 I made this skirt for R once, years ago - it must have been when she was 2 or 3. It's a really cute style and your photos are lovely. I'm looking forward to seeing your modified version. Thanks Marisa. Next year is school for this kid so it will be navy five days a week. I guess I can deal with Barbie pink until then! Yep! That is the exact shade of little girl! I'm so glad I'm not alone.... The misuse of the words venomous and poisonous in children's literature and media is a particular soapbox of mine. Oh yes, I think I've had that exact same conversation once. I also remember a Mr Men book where a leaf was described as "stupid", but the parent had crossed that out and written "silly" instead. Well no, parent a leaf is entirely lacking in intelligence, hence it is stupid and is not capable of being silly. And yes, I explained that to my kids out loud at the cafe that had a little book pile. It's a mother's job to both educate and embarrass her kids, right?! As I'm typing she's wearing the most delightful outfit completely ruined by insisting on wearing a pink way oversized ready to wear t-shirt under it all. Sigh. I say enjoy it while it lasts! 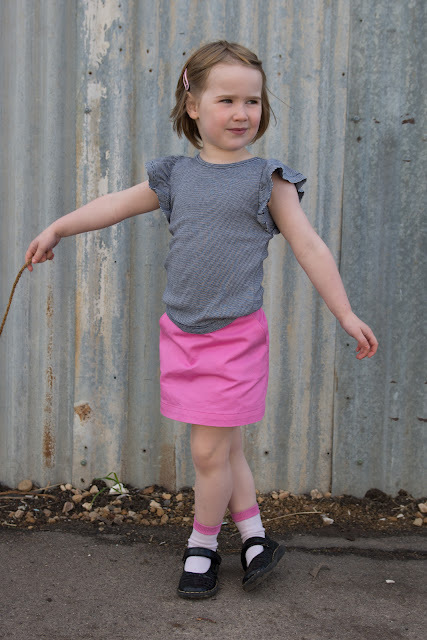 My girly pink preschooler now loves the colors black and blue and is "not really a dress person" at the ripe old age of 8. I'm feeling like I didn't capitalize when I had the chance. Though, she doesn't yet know there is an alternative for dressy occasions. Super cute skirt! And yes, Maggie would love that color too. "Barbie's careers" gag me. Like you could race a car those shoes. LOL. I have such fun times ahead. This is an adorable style and I only wish I could purchase it in paper form. I might have to bite the bullet, though, and obtain it in PDF. I love the fit on your little girl and she looks charming in 'bubble gum pink'. Thanks Karen. I've found the small size in paper. Let me know if that size will suit and which side of the world you're on and I'll send you the link. Very pink and very cute! Picturing this pattern over a baby diaper made me laugh though. And I'm sewing a swing set top and noticing how the directions have changed, as well. It was a particularly funny outfit. Kind of a twin set for a 12 month old!